The KZNSA Gallery has a new wall once again. The freshly painted wall is the result of a three-day street art course facilitated by Durban artists Mook Lion, Kev7 and Sphephelo Mnguni. The course took place from July 4 to 6, 2018. The KZNSA invite all to come and view the new wall that was a collaborative effort between local artists and children. 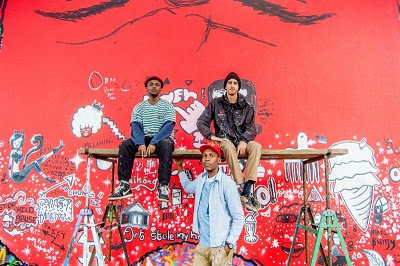 "[It] was great to apply the theory of participatory public art which I studied," says Durban muralist, Mook Lion. "The students gained an understanding of their potential by altering the public space and positively affecting the future. We helped the students realise their potential." The theme of the wall stemmed from conversations had with the course participants and something whimsically reminiscent of childhood: imagination. "The students were challenged to use their imagination and they did" says Mnguni. "What I learned from painting with the kids is that they’re very spontaneous with their ideas and they’re not afraid to change their minds whenever new ideas emerge" he explains. Kev7's experience of working with the younger generation was also positive, "getting the kids to just go wild with their imaginations, was the most fundamental concept in the creative process." Looking at the face, with your head tilted slightly, viewers will see the face of a person with wild and colourful hair, and with thoughts drawn on their forehead. Mook Lion had to explain to some confused onlookers, "the students’ ideas represented as drawings are literally placed in the forehead of our red character." The course was open to all from ages 6 up and open to adults, "I ended up learning a lot from the kids," reflects Kev7, "on how to create without judgement and expectations." Hoping in future to encourage adults and potentially create nuanced conversations about public art and murals as an important medium in the creative world. Kev7's greater hope as a working muralist in KwaZulu-Natal is to teach more people about the need for it. "The importance of public art as a platform is for communicating and translating cultural ideas," he says.